My “performance” complete, I drop to my chair, taking deep breaths, trying to avoid showing what the past action has cost me. I just “spent” my emotions, my strength, my all. I need to rest while I am still conscious of my surroundings. Rest to become clear and open to the next moment. I gave everything and tried to make it look easy, but no one knows the work it took to pull it off. A calm, peaceful cloak of invincibility envelopes me now. I am free. More alive than I had been at the onset of this endeavor. I am grateful that I can still offer such a multifaceted service to another. I’m good. Damn good, if I do say so myself. An astute observor will see it was not me that danced, but a Force On High. What has led up to this exhaustion and sheer sense of bliss? The feeling I get from dancing a dervish whirling. It’s just like persuading a jury of your client’s innocence during a hard-fought trial. My part with the jury, the minuet that I danced, has ended with that “closing” argument, and I turn, walk away, and I collapse inwardly, fooling onlookers with a fake stoic demeanor. By looking at the start and the finish of both. Long before I tried either endeavor, I battled with myself. “Who do I think I am,” I argued, “believing that someone out of school could go back after more than a dozen years?” Me? A lawyer? One that would speak to a jury day in and day out. Trial after trial, performing three jury trials back to back to back, with no break in between except a run to the rest room. And what about dancing? Not any run of the mill type of dance. Learn to dance as a Muslim. That’s what a Sufi is — a sect of Islam that loves Allah so much that created 99 different names for Him. Thank God, that Sufis are non-violent mystics, also known to the world as “Lovers.” I would not have to read any of the “sword verses” except, perhaps, for the poetry where I would be more than willing to die for one last sight of my “Beloved,” the smell of perfume, the feel of an embrace that would take me into eternity. But whirl? Around and around? Almost non-stop? At my age? In front of others who get as much joy in watching the dance as the one dancing with the One? Well, I can ‘mash potatoes.’ I can do the ‘slop.’ Now tell me . . . Do you like it like this? . . . tell me . . . (Tell Me) . . . tell me . . .
DO YOU LOVE ME? I CAN REALLY MOVE. DO YOU LOVE ME? I’M IN THE GROOVE . . NOW . . THAT I . . CAN . . DANCE . . .
Tell me . . . (Tell Me) . . . Hey, watch me now . . . 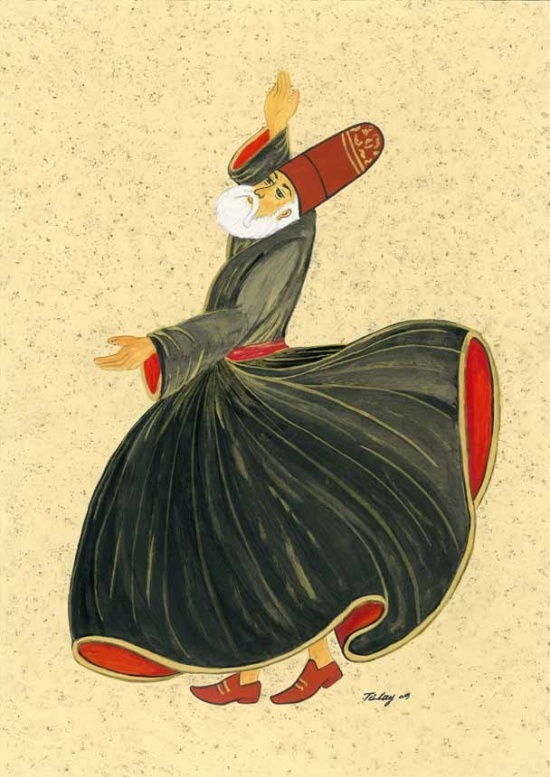 I danced in a class of Sufi students in a Quaker meeting in Germantown, PA. Somewhere along the way I realized I could do it — whirl like a dervish and unabashedly praise a God I hold deep inside. But first I must “disobey” that little voice that says “no, you can’t.” You can’t dance that way. You can’t serve as a trial attorney. And listen for another voice. One that said “yes, you can!” And that’s made all the difference. And why you’ll see me sitting after each performance because it’s taken my all to proof the “yes” word is still worth waiting to hear. This entry was posted in Letting Go, meditation, Surrender, understanding and tagged awakening, Buddha nature, enlightenment, heartfelt, Higher Self, meditate, Spiritual, spirituality.